Chigozie Obioma has written biblical parable in his debut novel The Fishermen. The book explores the relationships of four brothers. 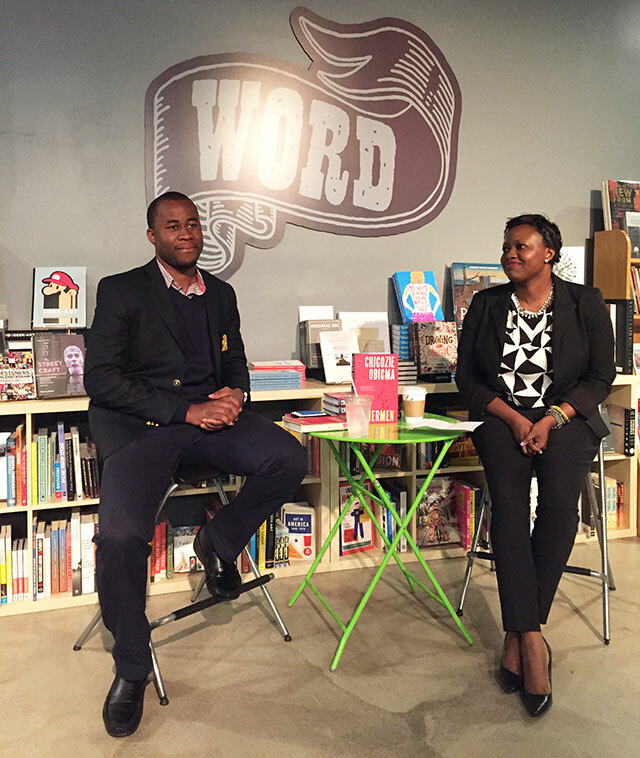 He read from The Fishermen at WORD Jersey City and wss joined in conversation by Nana-Ama Kyerematen, founder of the website AfriDiaspora. Obioma left Africa and his family to attend university in Cyprus. He was very homesick. He missed his brothers and sisters. He comes from a family of twelve. A 2009 phone call from his father lead to the germination of the novel. His father explained that his two oldest brothers were headed out on vacation together. His two oldest brothers were born less than a year apart. Growing up they had been hyper competitive with each other, their rivalry so fierce they sometimes would fight. Yet now as adults in their thirties, they were the closest of Obioma’s siblings. He explains that he wanted to capture the changing nature of brotherly relationships in his novel. The Fishermen focuses on four brothers with what Obioma calls a “regular” African mother but a strict disciplinarian father. The brothers encounter a vagrant soothsayer who offers them a prophecy. The narrator, Ben, tells the story two decades after it took place, when he was a nine-year-old boy. This point of view allowed Obioma the distance he wanted to achieve for the characters. The vagrant prophet served two purposes for Obioma. He had been reading parts of William Durant’s The Story of Civilization, an eleven volume history. The theme repeated throughout these books and the fall of the civilizations chronicled by them was that great civilizations cannot be destroyed from the outside. Instead, they always fall from within. He sees the man as playing this role. The prophet acts like a catalyst to create the force necessary to bring about change. Animals play a role and often are used as chapter titles throughout the novel. Partly this is because Obioma has always had a fascination with non-human creatures. However, the animals also create a reference point for Ben, the narrator, to tell a story. “I cannot tell a story without a comparison to something else,” he says. When Obioma was a child, he spent a period of time in the hospital. His father would visit and tell him stories. He enjoyed the stories, but once he was released from the hospital, his father stopped storytelling. Finally Obioma asked: “Is it only when I’m sick that his man tells me stories?” His father then gave him a book off the family’s bookshelf, and had him read his own stories. Reading the books meant Obioma realized his father had simply been retelling stories from the books. Once he learned the magic of stories they came from books, he started reading all the time. He knew he wanted to be a storyteller. 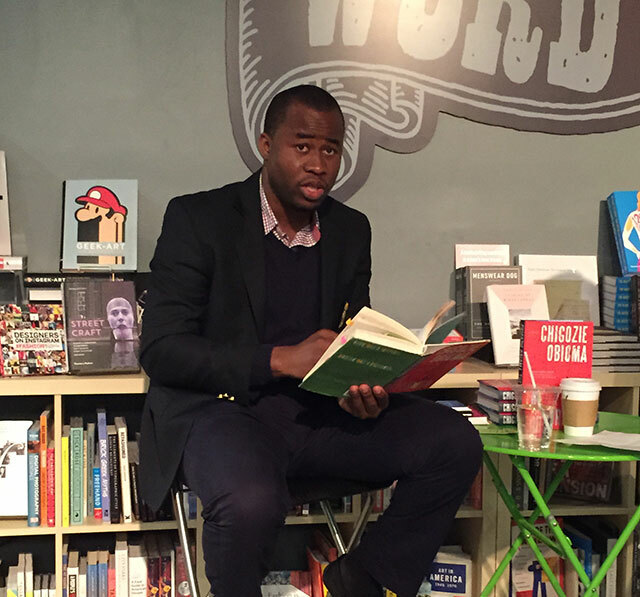 Obioma has read through Shakespeare’s body of work. He has a fondness for ancient Greek literature too, like the works of Euripides. His school of course had standards of British literature, but it was the Greek literature he loved. He read through the Odyssey and the Iliad during his lunch breaks. The school library had a large volume with both works inside, but it was housed in the part of the library that students could not take books out of. So he read them forty-five minutes a day for months. “I don’t believe Africa is exotic anymore,” he says.